Intel will use its move to a 45nm chip production process primarily to increase performance rather than boost battery life or reduce energy consumption, the company admitted today. Upcoming Core 2 and Xeon processors based on Intel's 45nm 'Penryn' architecture are due to go into production later this year. 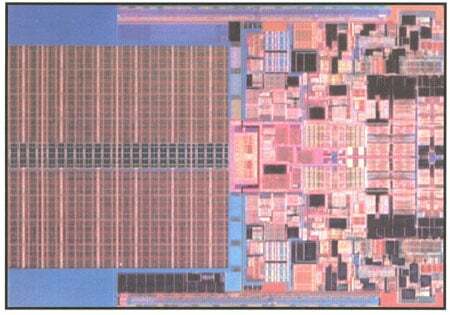 The chip maker confirmed what we'd gleaned from leaked roadmaps, that the 45nm chips will contain more L2 cache than their 65nm predecessors. Dual-core chips will get up to 6MB of cache, while quad-core parts will get up to 12MB. Since quad-core Penryns will again be made by fitting two dual-core chips together in a single package, that's no great surprise. Intel Digital Enterprise Group chief Steve Smith, speaking to journalists today, didn't address mobile processor speeds, but he did say that 45nm desktop and server chips will be made available clocked to 3GHz and above. Xeon DPs will see their frontside bus speed upped to 1600MHz. Even so, the new mobile, desktop and server chips will fit into motherboards designed for today's Core 2 Duo, Core 2 Extreme, Core 2 Quad and Xeon mobos, BIOS updates aside. The desktop and server CPUs will operate within today's thermal and power envelopes, Intel said: 65W for desktop dual-cores; 95W and 130W for desktop quad-cores; 40, 65 and 80W for dual-core servers; and 50, 80 and 120W for quad-core Xeons. On the mobile side, Smith said 45nm Core 2 chips would provide better performance than 65nm versions but with "the same battery life benefit". That will come primarily from the new deep power down state that's due to be introduced with revised 65nm Core 2 Duos in May, released alongside the next major version of the Centrino platform, 'Santa Rosa'. It involves turning off a core's clock and caches. Smith claimed the microarchitecture tweaks introduced with Penryn, the addition of SSE4 and, in particular, the higher clock speeds will yield a dual-core gaming performance increase of up to 20 per cent and a 40 per cent reduction in video encoding times. Running bandwidth-intensive workloads, 45nm server chips yielded a 45 per cent performance boost, he added.